Set in the middle of the arid region between the Sahara desert and the equatorial savannas of Africa known as the Sahel, Niger is no stranger to drought. In recent years, however, droughts have hit more often, started earlier in the season, and lasted longer, creating a cycle of food insecurity that is becoming more difficult to break. Niger’s president, Mahamadou Issoufou, recently spoke to PBS NewsHour about his country’s aggressive re-forestation strategy, designed to improve food security by capturing more natural moisture and raising soil nutrient levels. “We are convinced that drought does not need to mean famine,” Issoufou, told special correspondent Fred de Sam Lazaro. 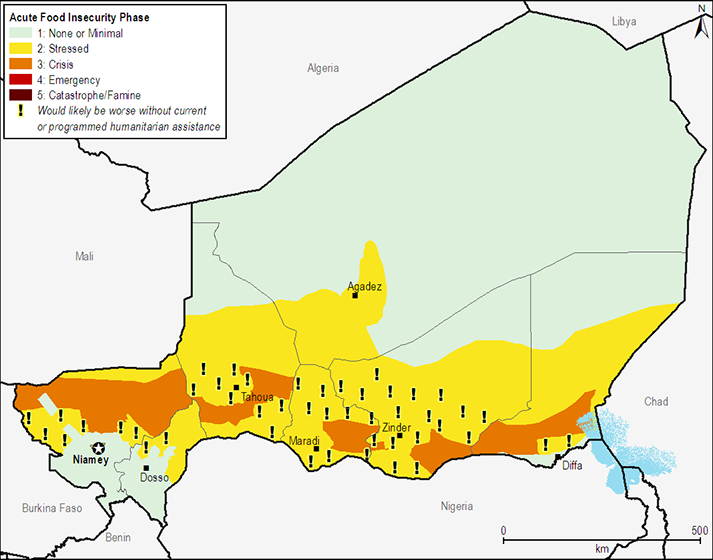 But while Issoufou’s campaign to strengthen food security offers reason for optimism, significant challenges remain if Niger is to break the cycle of drought and famine, including a population growth rate of 3.5 percent a year – one of the fastest in the world. For decades, a combination of environmental and man-made factors has slowly exacerbated Niger’s vulnerability to drought and food insecurity. While the Sahara’s gradual southern expansion has driven Niger’s desertification, an old colonial law (since overturned) making trees state property contributed to runaway deforestation. For the state, trees were an important resource as timber; for farmers, trees were a nuisance that stood in the way of planting new crops. With little incentive to preserve the already-sparse natural tree coverage, by the 1970s, the country’s landscape looked like “a virtual desert,” de Sam Lazaro says. Deforestation only accelerated desertification and the two trends were all the more impactful since they hit hardest in Niger’s semi-arid south, where the bulk of the country’s food is grown and harvested. By the mid-1980s, after major droughts had struck the country on and off for the past decade, a low-scale, individualized effort began among farmers to maintain the trees on their property. That effort was finally formalized under the current president, who entered office last year “declar[ing] food security a top priority,” according to de Sam Lazaro. The program builds on farmers’ earlier work through a greening initiative that provides both near- and long-term relief to Nigeriens struggling against food insecurity. 3N employs Nigeriens during the “hunger season” – a stretch of time before the harvest starts – but rather than planting new trees, workers instead dig holes that capture rainwater and seeds that are already there – either in manure left behind by livestock, or blown in by the wind. Over time, de Sam Lazaro reported, those holes provide long-term relief for farmers as trees regrow, returning much-needed nutrients to the soil and, through their foliage, providing shade and retaining rainwater for surrounding crops. That work is supplemented by an outreach campaign that educates farmers about the end of the colonial-era tree law and the benefits that well-maintained trees can bring to farmers, their households, and their crops. “Trees that are pruned grow sturdier trunks, yielding abundant firewood, the main cooking fuel,” de Sam Lazaro reports. “The leaves form livestock fodder and trap moisture in the soil. Improved soil fertility can mean better harvests.” And, importantly, those benefits can start accruing immediately. “Even in the first year, you already have some benefits by leaves and some twigs the women can use as firewood in the kitchen,” said Chris Reij, a Dutch scientists who has studied agroforestry in the Sahel since the 1970s. In villages that have prioritized re-greening, resilience is already growing. In Dan Saga, a village near Niger’s southern border with Nigeria, even though “drought took a severe toll on the harvest last year,” according to de Sam Lazaro, past surpluses stored in a grain bank mean that hasn’t translated to famine. Individual and state-led re-greening efforts have turned Niger into “the only country in Africa to have actually added forest to its land” over the past two decades, de Sam Lazaro reported. During that time, 200 million new trees grew in Niger, and that, according to Reij, has bolstered agriculture by an additional 500,000 tons of food per year – enough to feed 2.5 million Nigeriens, or 15 percent of the population. From 5 to 55 Million People? Indeed, population growth – both historical and projected – is a key part of Niger’s food security story and deserves more attention. Past population growth helped fuel the country’s rapid deforestation in the 1970s and 1980s, and since the early 1990s, Niger has reliably been among the world’s fastest growing countries. Between 1975, when the country was a “virtual desert,” and today, more than 10 million Nigeriens have been born. In the face of such growth, the country’s capacity for food production has not kept pace; while population growth is 3.5 percent a year, food production increases by only 2.5 percent, indicating a persistent and growing gap between the two. And, because of the multiplicative effects of high birth rates, the UN estimates that by 2050, Niger’s population will be an astounding 55.4 million people (and that’s the medium variant projection). De Sam Lazaro’s report is part of joint project “Food for 9 Billion,” with Homelands Productions, the Center for Investigative Reporting, American Public Media, and PBS. Previous reports examined food security in East Africa, Egypt, and the Philippines. Sources: The New York Times, United Nations Population Division. 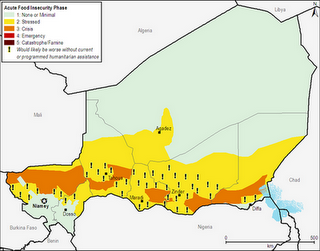 Video Credit: PBS NewsHour; Chart: Famine Early Warning Systems Network. I have read this article from start to end. Simply great.